Thousands packed the Revivaltime Tabernacle in Toronto, Canada, on Thursday, August 3, to pay their final respects to Jamaica’s cultural icon, the Hon. Louise Bennett-Coverley (Miss Lou). The church, which seats over 2,000, was packed to capacity, with speaker after speaker regaling Miss Lou’s accomplishments and contribution to Jamaica and its people. The more than three-hour service, which brought laughter and tears from the audience, was presided over by Bishop Dr. Audley James, accompanied by Rev. Dr. Pat Francis and Rev. Easton Lee. In attendance were Canadian and Jamaican government officials, members of the diplomatic corps, police officials and heads of Jamaican organizations. He noted that the subjects in her anthology of radio commentaries, Aunty Roachy Seh, revealed the depth and breadth of her thought and consequent influence on Jamaicans of all walks of life. 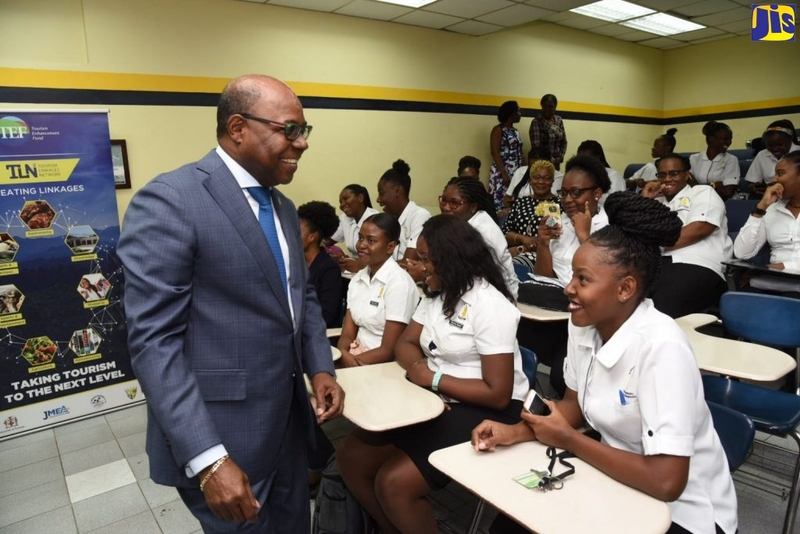 “Issues of language, race, ethnicity, culture, identity, gender, politics, journalistic ethics, music, censorship, heritage, education, Caribbean integration, micro economic and social amenities, all find a place in this deceptively thin volume,” he said. Ms. Forbes said her fondest recollection of Miss Lou was when they acted together in the 1973 revival of the Pantomime, Queenie’s Daughter, in which Miss Lou played the mother and she played the daughter. “The song in the pantomime, Lionheart, describes Miss Lou. She was a lionhearted woman – loving her craft, devoted to her husband, a surrogate mother to all children everywhere, whenever and wherever she went”. President of the Jamaican Canadian Association, Sandra Carnegie-Douglas, borrowing a phrase from American poet Maya Angelou, said Miss Lou “a fi wi phenomenal ooman. Miss Lou exuded love, she exuded pride in identity, she exuded goodness and she was filled with laughter. Through her work, and her passion she elevated the common folk – the common Jamaican. She was, in deeds, in words and in person – a woman of the people and a woman for the people.”Consul General to Toronto, Anne-Marie Bonner, read messages of condolences from Toronto’s Mayor David Miller and President of the University of Toronto, David Naylor, while Jamaican-born Mary Anne Chambers, Minister of Children and Youth Services, read a message from Premier of the province of Ontario, Hon. Dalton McGuinty, in which he thanked Miss Lou for making the city of Toronto and the province of Ontario, her home. Actress Denise Jones had the audience in laughter when she recited one of Miss Lou’s poems, ‘Sarah Chice.’ The scripture readings were done by Miss Lou’s grandson and adopted daughter, Clayton Coverley and Simone Watson. Some of those in attendance included Jamaica’s Acting High Commissioner, Patricia Evering; Jamaica Tourist Board Regional Director for Canada, Sandra Scott; Deputy Chief of Police Keith Forde; Hon. Gerry Phillips, Minister of Government Services; Hon. Michael Colle, Minister of Citizenship and Immigration; former mayor of Toronto, Barbara Hall; Toronto City Councillor Michael Thompson; and Brampton City Councillor Garnett Manning. Miss Lou died on Wednesday, July 26, in the Scarborough Grace Hospital at the age of 86. Her body and the remains of Eric Coverley, her late husband, were returned to Jamaica on August 5. Mr. Coverley was re-interred on Sunday Aug.6 at National Heroes Park and the official funeral for Miss Lou will be held on Wednesday, August 9.